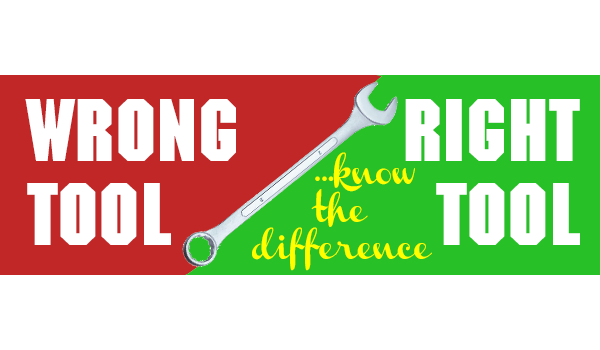 In Wrong Tool/Right Tool we’ll show you the tools you should be using when working on antenna or satellite installations. Even in an emergency, don’t be tempted to strip a cable using a knife. You’ll probably get the worst-case scenario: a cable that works pretty well when you are done with it but gets flaky later on. Why? If you are using copper-coated steel, stripping a cable with a knife will probably scratch the center conductor making it almost useless if there’s the slightest bend. You’ll probably also damage the outer sheath of the cable, the dielectric, and cut too much off the outer shielding cable. It’s a bad deal for all involved. Sure, it makes you look all macho to shave a cable with a pocket knife and pull the dielectric off with your teeth, but it’s a real bummer when that cable doesn’t work. Coaxial cable should always be prepped with a proper cable stripper. A stripper like this will help you trim the dielectric to the proper length, and get just the right amount of copper shield to meet up with a compression connector. This is the right way to do a coaxial cable and doing things the right way means fewer problems later on. Remember that today’s coaxial cables have much more information going through them than ever before, and even the slightest nick or lost bit of copper can make a difference. It doesn’t matter if you’ve been making coax cables for 50 years, it’s worth getting the right tools for the job. NICE AND EASY: What’s the difference between the red button and the record button on a DIRECTV remote?